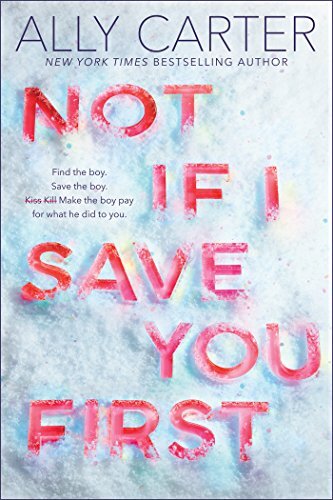 Ally Carter's Not If I Save You First sounded like a PG-13 version of Meg Cabot's 2002 romance novel She Went All the Way, and since that's one of my favorite contemporary romances, I was pretty stoked to read it. Carter's take isn't quite as funny as Cabot's, but there's more than enough charm and action to satisfy her many fans. As the son of the president and the daughter of a top Secret Service agent, Logan and Maddie have been friends for what feels like forever. But after thwarting an attempted kidnapping, Maddie's dad drags her off to a remote cabin in Alaska. When Logan never responds to her letters, Maddie assumes their friendship is over, and when he shows up six years later she's in no mood to forgive and forget... until a mysterious assailant kidnaps him. Maddie might want to kill Logan, but she's not about to let some rando bad guy do it for her. Not If I Save You First has a lot of strengths: solid romantic chemistry, snappy one-liners, plenty of action. The plot development felt a little rushed in parts (I'm assuming it's a standalone), but everything important was there. And young fans of this novel are in luck: as soon as they're old enough to read adult romance novels, Meg Cabot's take on this material is waiting in the wings, and it's even better.